Ride the Future Tour (RTFT) is a 44 day electric vehicle cross country trip from Charleston, SC (July 4th, 2013) to Google headquarters in Mountain View, CA (August 16th, 2013). 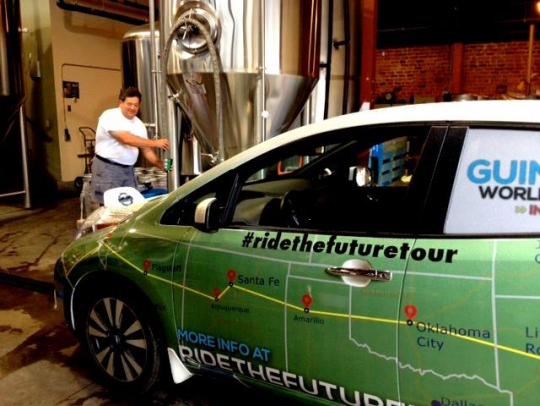 The tour is focused on promoting electric vehicles as the future of sustainable transportation. 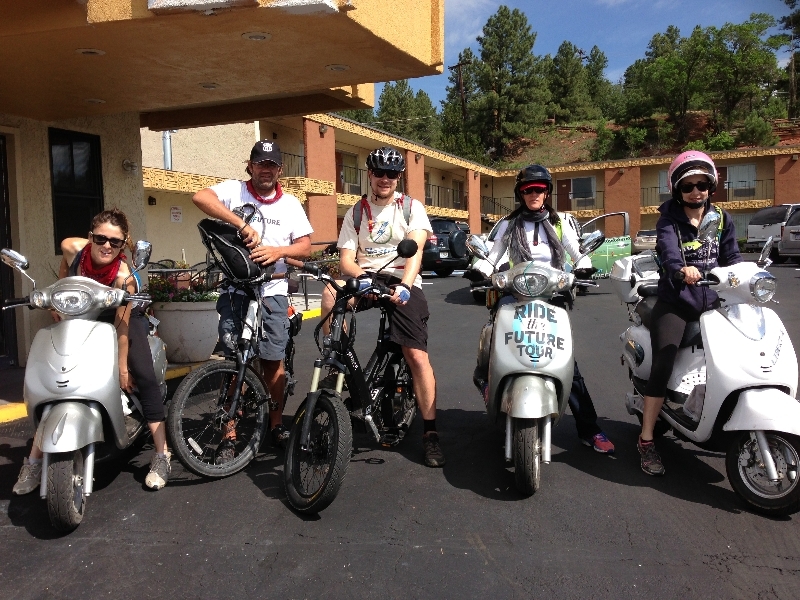 In addition to getting the word out about EV’s, the tour is on route to set 4 Guinness Book of World Records for the longest trip for an electric car (Duane Leffel driving the Nissan Leaf), electric motorcycle (Ben Rich riding the Zero S), electric scooter (Susan Jones riding a Xenon), and electric bike (Ben Hopkins riding an A2B Alva). And the story gets even better! 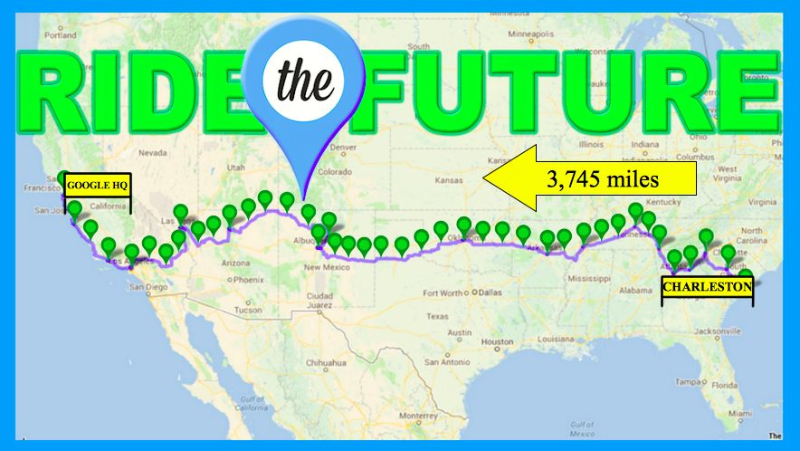 For Ben Hopkins (English) and Rachel McCarthy (Australian) the Ride the Future Tour has been an opportunity for them to visit and experience the US for the first time. Dominique Arciero is Susan’s daughter, an avid song writer and singer, plays piano, guitar, mandolin, and harmonica, in addition to riding a Xenon electric scooter cross country! Along the way the RTFT has a documentary film crew recording all of the action. Jonathan Becker is the producer, Evan Scott is in charge of filming and George Wymenga is responsible for the sound. I had a chance to hangout with these guys for a bit and they are a great group of guys who take their work seriously but have a lot of fun doing it! Here is a teaser video for the upcoming Ride the Future Tour documentary film. To kick things off, I met up with the team at the Lumberyard Brewery in Flagstaff, AZ. They had just completed their trek from Winslow to Flagstaff but they still had enough time and energy to meet with a group of locals at the brewery to show off the vehicles, provide A2B e-bike test rides, and answer any questions about EV’s or the tour. Fun was had by all and there was definitely a lot of interest in the tour and the EV’s. Duane tries to recharge the Nissan Leaf with beer at the Lumberyard Brewery in Flagstaff, AZ! The next day we embarked on our journey from Flagstaff to the famous Grand Canyon. 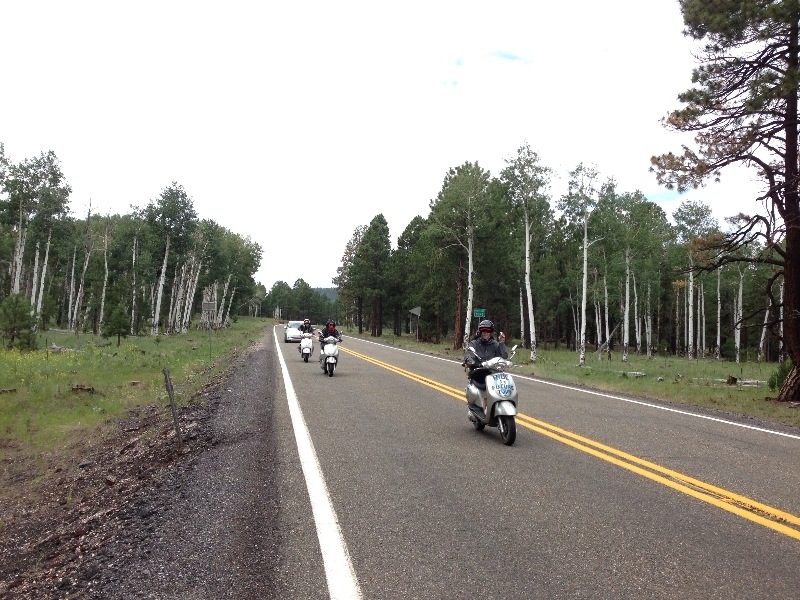 This is an 80 mile trip that climbs from 7,000 ft up to 8,000+ and then back down to around 6,500 ft. Here is a map of the route. And since a picture is worth a thousand words, here are a few pictures and a few words to show you what the trip was like. 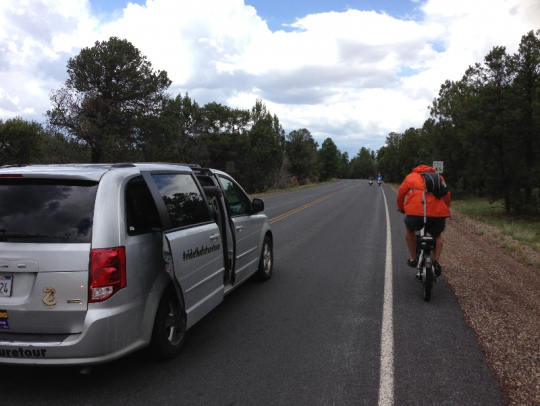 The start of the Flagstaff to Grand Canyon ride! From left to right: Dominique Arciero, Ben Hopkins, Pete Prebus, Susan Jones, and Rachel McCarthy. Not pictured but part of the crew: Ben Rich (Zero e-motorcycle) and Duane Leffel (Nissan Leaf). 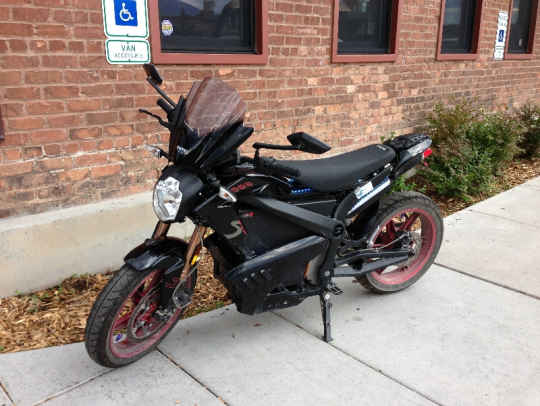 Ben Rich’s Zero S ZF9 electric motorcycle. Ben Rich definitely enjoys flying around on his Zero. Since his EV is the quickest, he is able to zip ahead to checkout the sites before the rest of the crew gets there. 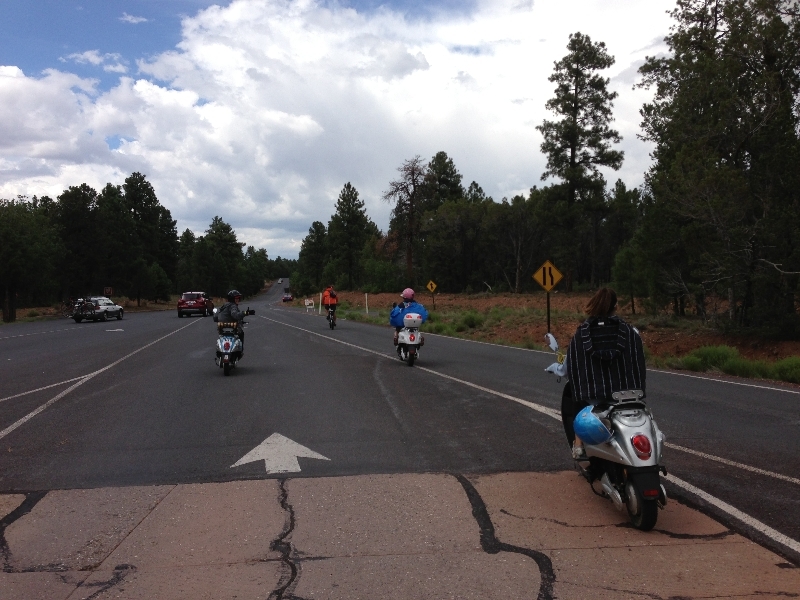 Susan, Dominique, and Rachel e-scootering at 8,000+ feet among the aspen trees near Flagstaff. The journey to the Grand Canyon had some scenic high elevation riding mixed with a rolling high desert landscape. 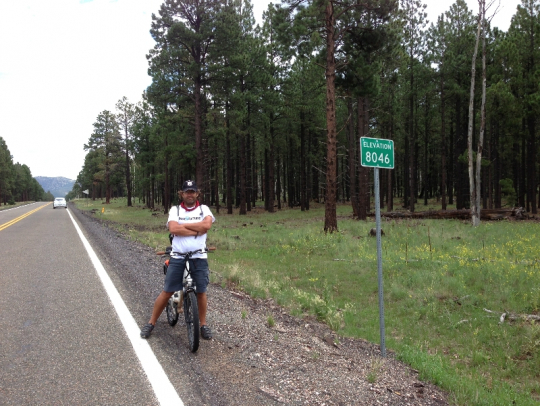 Ben Hopkins enjoys a quick break at the route’s high point of 8,046 ft on the west side of the San Francisco peaks, just north of Flagstaff. The Nissan Leaf, Ben and I enjoy a quick photo break on the north side of the San Francisco peaks outside of Flagstaff, AZ. The highest peak of this mountain range is 12,500 ft! Everywhere we stopped people were asking the crew about the electric vehicles. 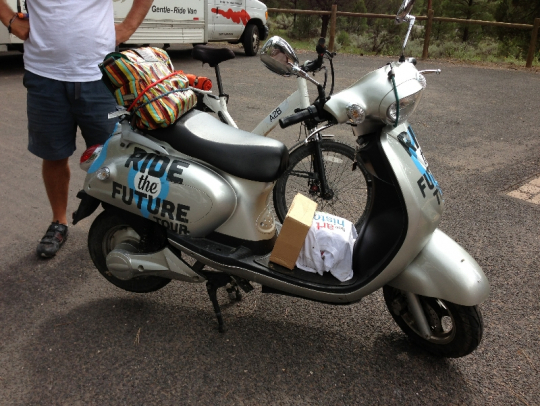 It was very inspiring to see the RTFT crew in action spreading the word and enthusiasm about e-mobility. This is Susan’s Xenon electric scooter that she is attempting to ride to a Guinness World Record for longest e-scooter trip. 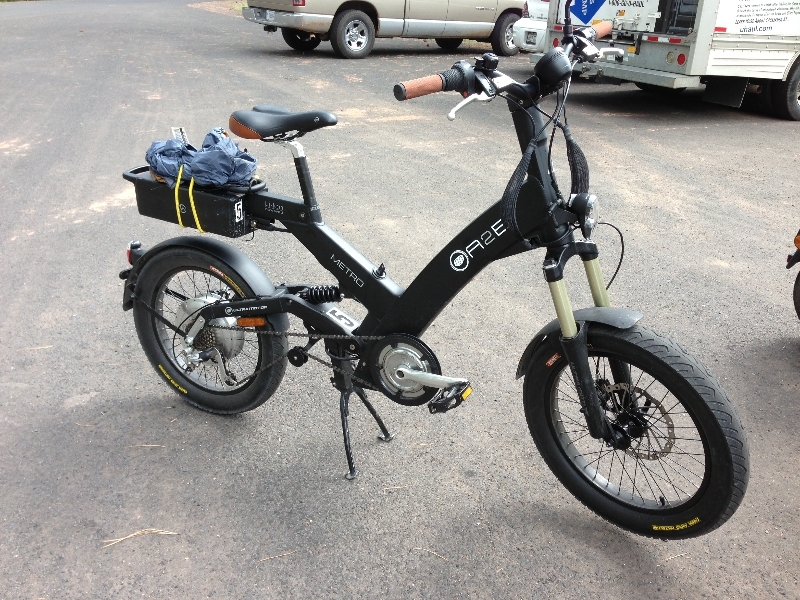 This is the A2B Metro e-bike that I piloted to the Grand Canyon. The Metro handled the rough roads and occasional off road adventure with ease. It’s wide tires and full suspension frame provided a smooth ride! 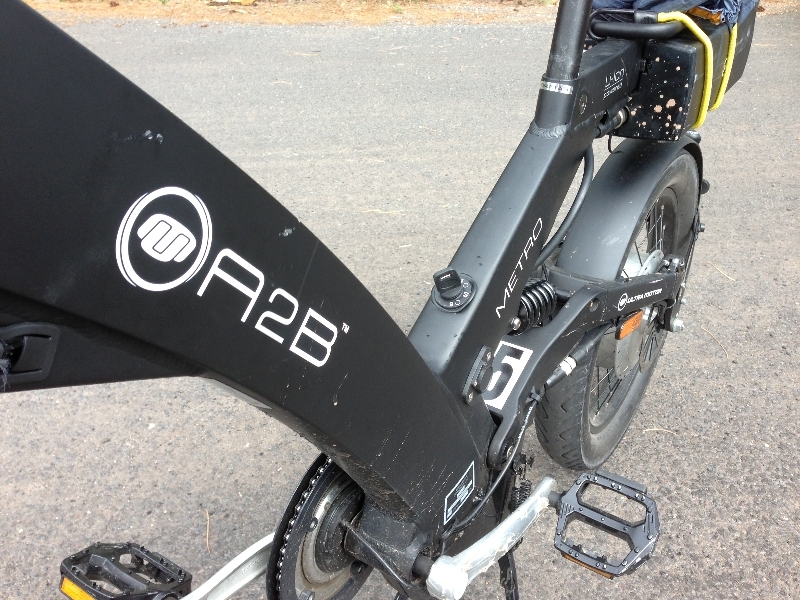 Here is a close up of the aluminum frame of the unique looking A2B Metro e-bike. 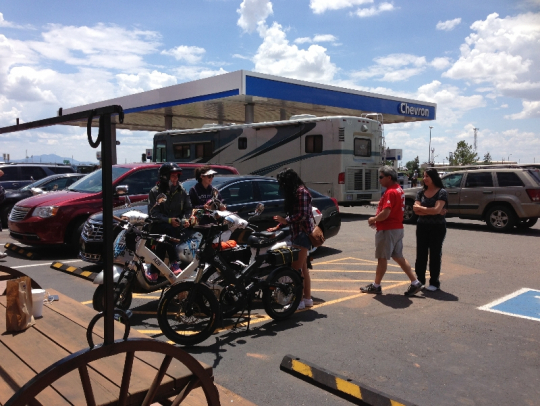 Susan told me that the e-bikes were popular among many of the folks that they have met along their cross country trek. 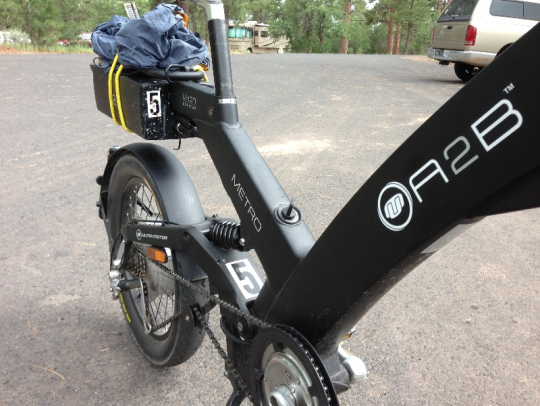 Another shot of the A2B Metro frame. This Uhaul truck is the uber support vehicle with lots of extra parts, tools, bbq, etc. Sean Scott is the man behind this support vehicle. 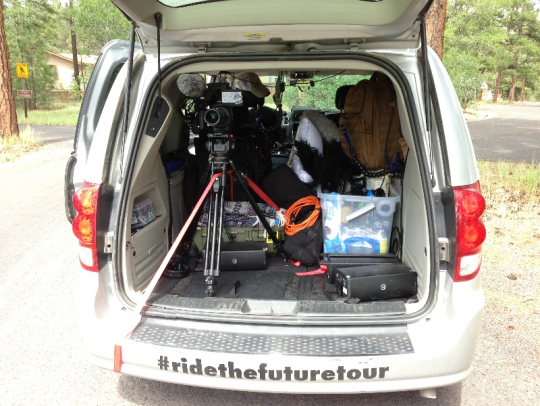 The RTFT filming van! The RTFT documentary film crew has this mini van decked out with tons of video and audio equipment. 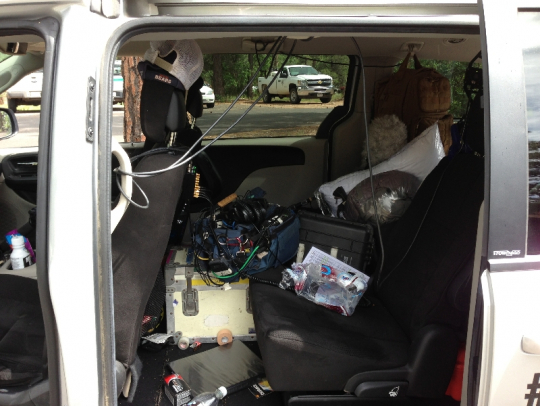 You can see the video camera strapped into the back of this van. The RTFT documentary film crew has an amazing microphone system that can pick up rider conversations while they ride/drive the electric vehicles. This is Ben Hopkins’ A2B Alva electric bike that he hopes to set the Guinness Book of World Records on. In the background, Ben, Sean, and the film crew (Jonathan Becker, Evan Scott, and George Wymenga) take a break just before the Grand Canyon. Canyon bound! 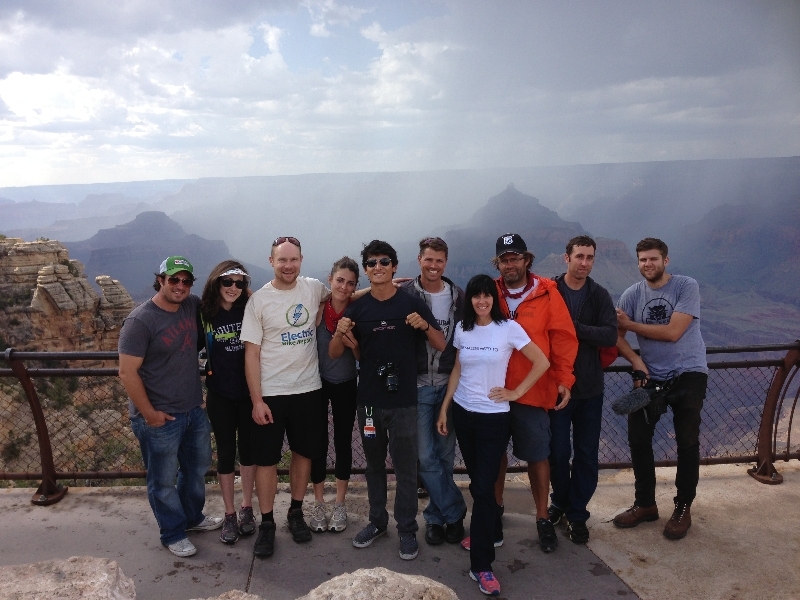 The RTFT crew enters Grand Canyon National Park. 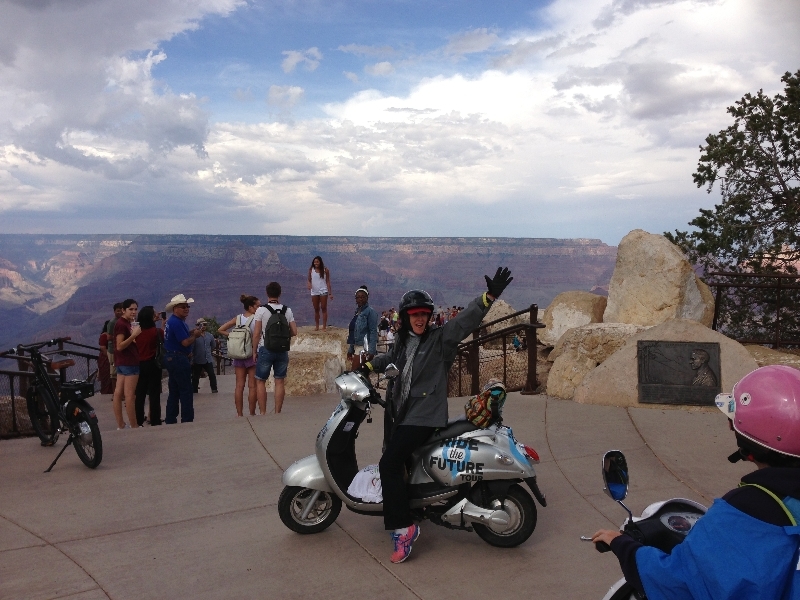 Susan and Rachel e-scootering towards the Grand Canyon rim. The RTFT documentary film crew catches Ben Hopkins in action before reaching the Grand Canyon rim. Rolling up to the canyon edge! Susan rides up to the edge with Evan filming on the back of Rachel’s scooter. The film crew is all over this monumental part of the RTFT tour. The A2B Alva and A2B Metro e-bikes at the edge of the Grand Canyon. The Canyon is certainly a great place to ride an electric bike to! 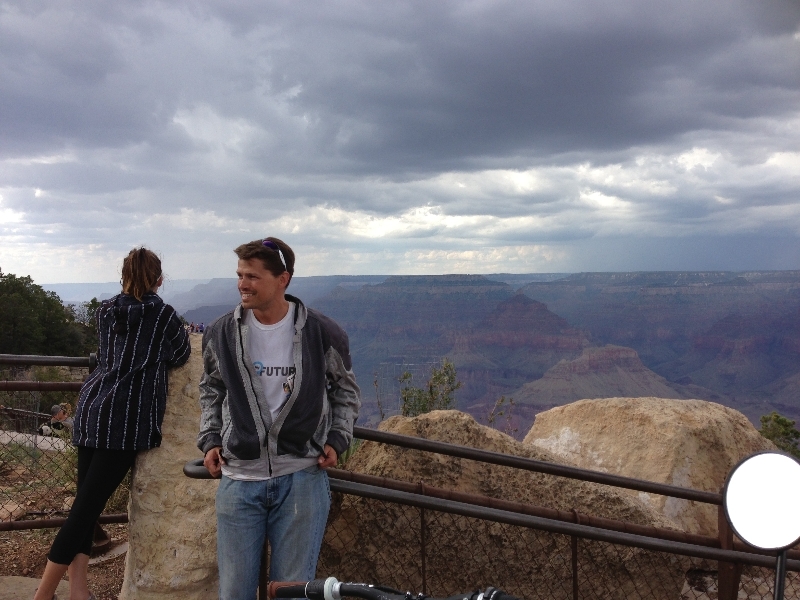 Ben Rich enjoying some time at the Canyon. He was able to make quick time from Flagstaff to the Canyon on his Zero e-motorcycle. That gave him a little more time to see the sights. 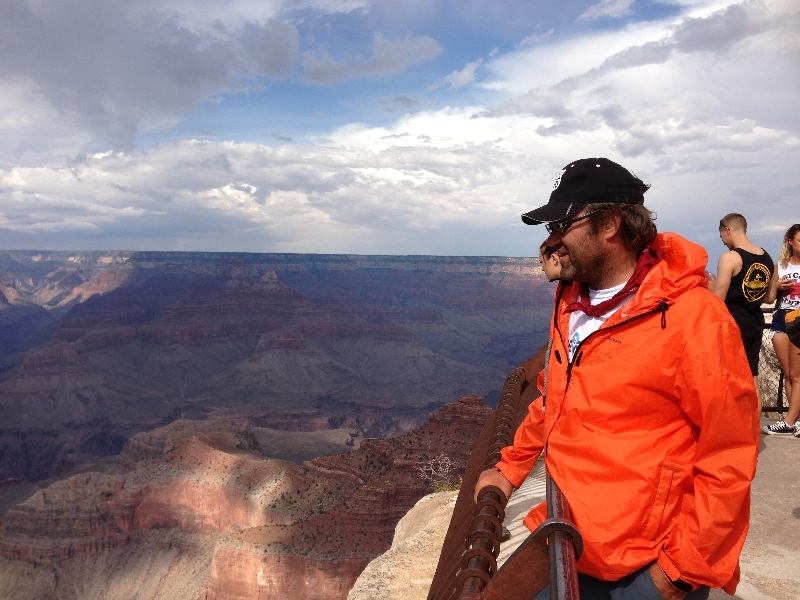 Ben Hopkins enjoying the views of the Grand Canyon for the first time. Ben currently lives in Bangkok, Thailand and this trip was his first trip to the United States. 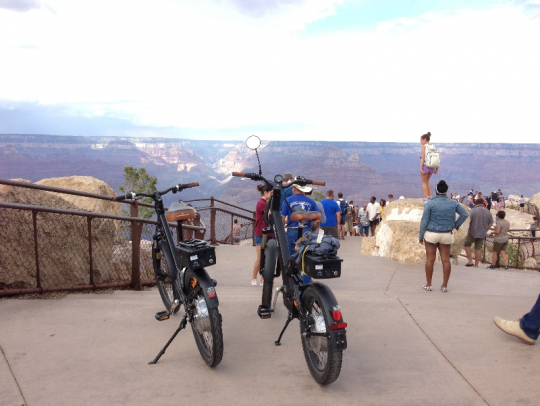 Setting a Guinness World Record on a cross country e-bike trip is a great way to see the United States for the first time! 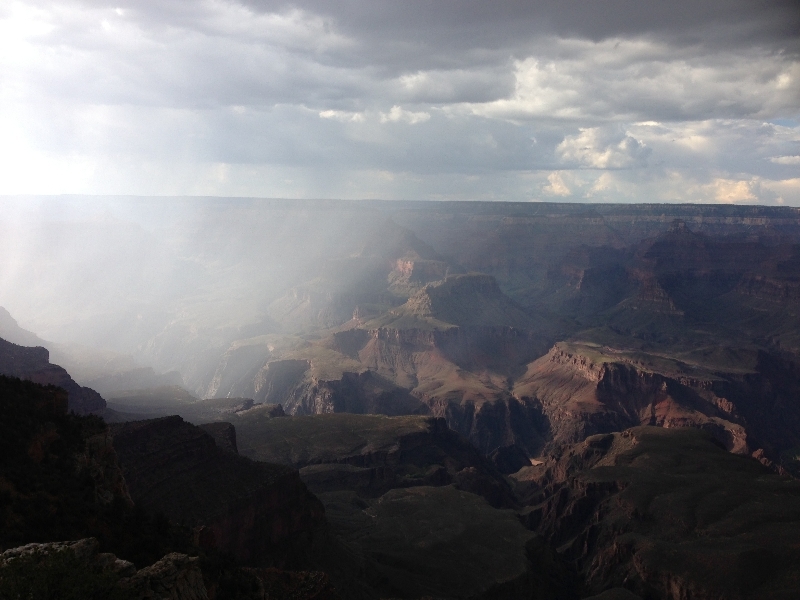 The true grander of the Grand Canyon is so hard to capture on film. You really have to be there to truly experience its beauty. 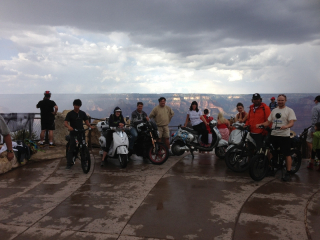 The Ride the Future crew and I enjoying some time at the Canyon edge. Left to right: Jonathan, Rachel, Pete, Domonique, Sean, Ben, Susan, Ben, George, and Evan. 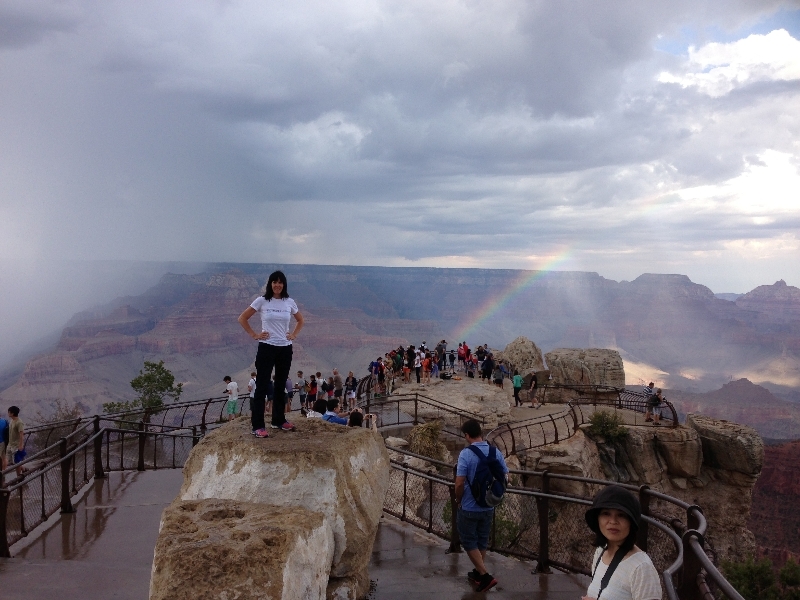 Team leader, Susan, shines in the spotlight of a rainbow that formed in the Canyon. Great work Susan! 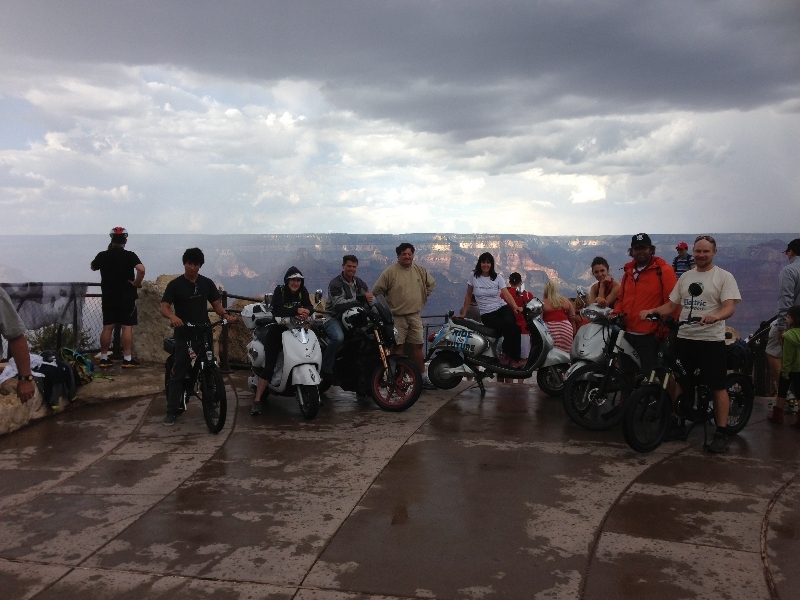 The Ride the Future crew and I on our electric vehicles at the edge of the Grand Canyon. 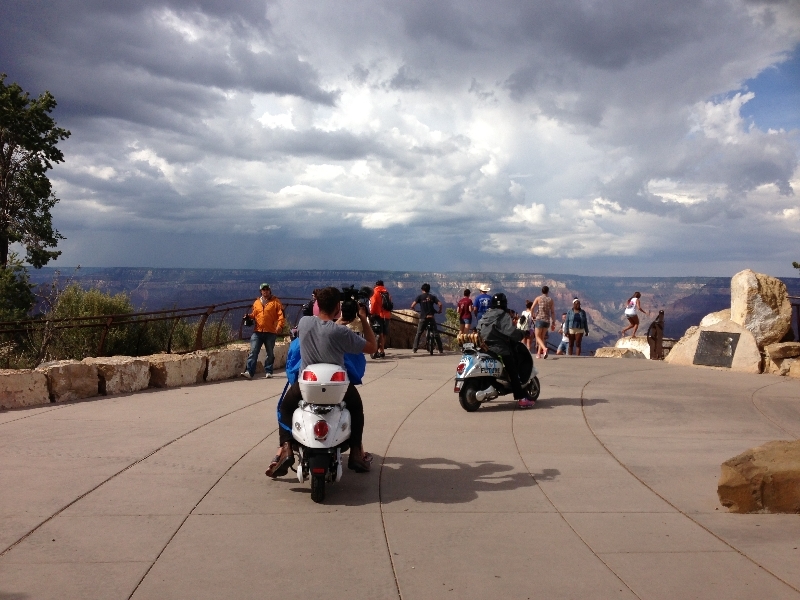 We had to dodge a few rainstorms during our time there. As you can see, it was a day to remember. Riding an electric bike to the Grand Canyon with these amazing people was something I won’t soon forget. 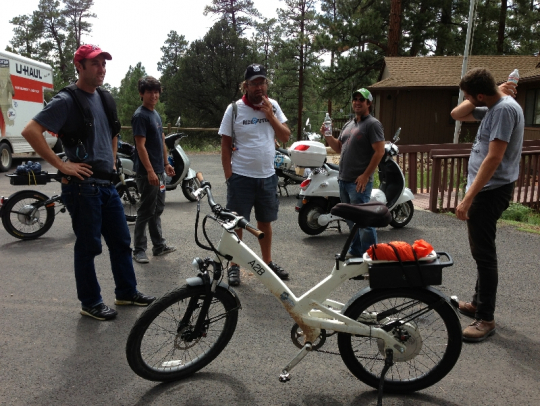 It is very inspiring to see the whole Ride the Future crew in action and spreading the word about electric mobility. They are working hard and having fun getting people interested in EV’s. 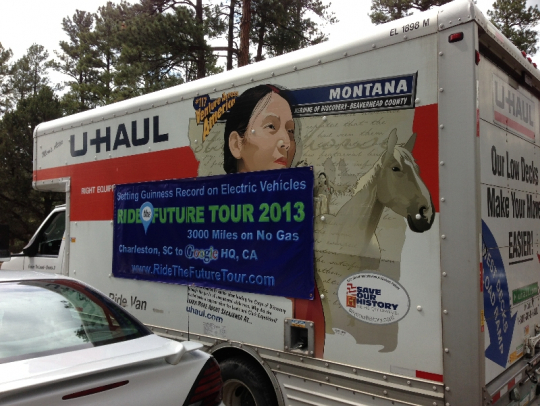 You can follow the Ride the Future Tour at their Facebook page and Twitter profile and website. Find out if they are coming to a town or city near you; I highly recommend meeting up with them! Nice promotion for Personal E-Vehicles. 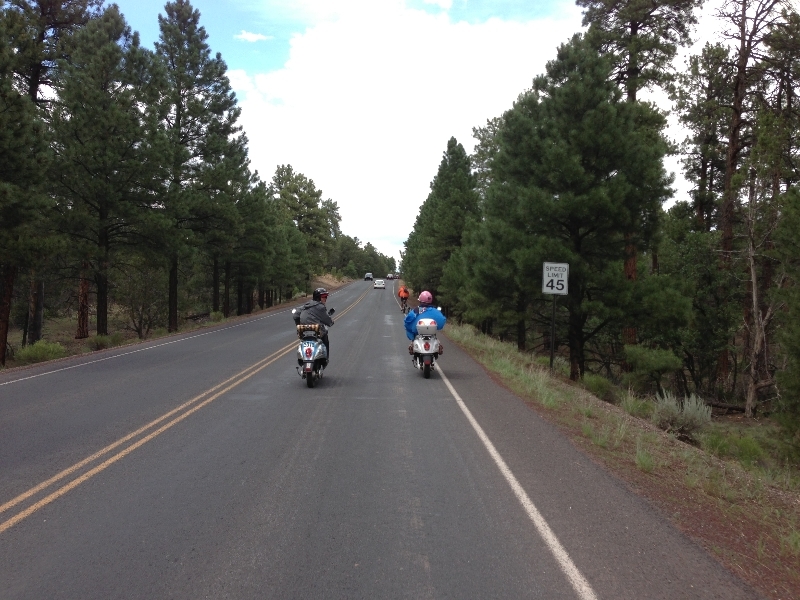 All bikes made the 3,400 miles from East to West with only 1 puncture and 2 broken spokes. All the best and glad you enjoy your A2B.